It’s deja vu all over again. Supernatural’s first location shoot of season eight is in the same area as the last location shoot of season seven — Burnaby Fraser Foreshore Park opposite Nokia headquarters, which played nefarious Sucracorp in the finale. Even when I heard Supernatural was scouting the location a week or so ago, I didn’t think they would show up here today. 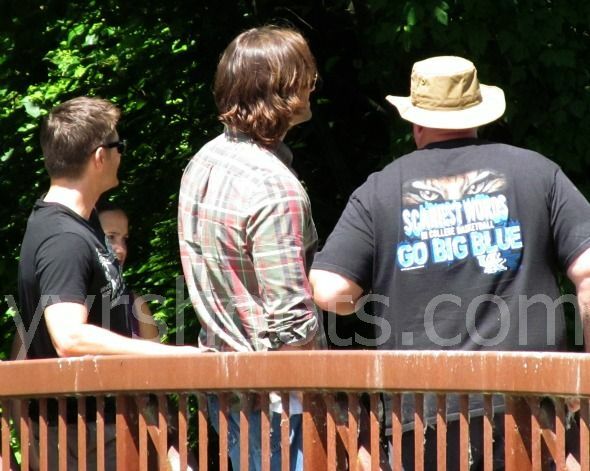 But there on a bridge over the Fraser River Path at lunchtime were the Winchester Brothers themselves, aka Jensen Ackles and Jared Padalecki, accompanied by their bodyguard Clif. 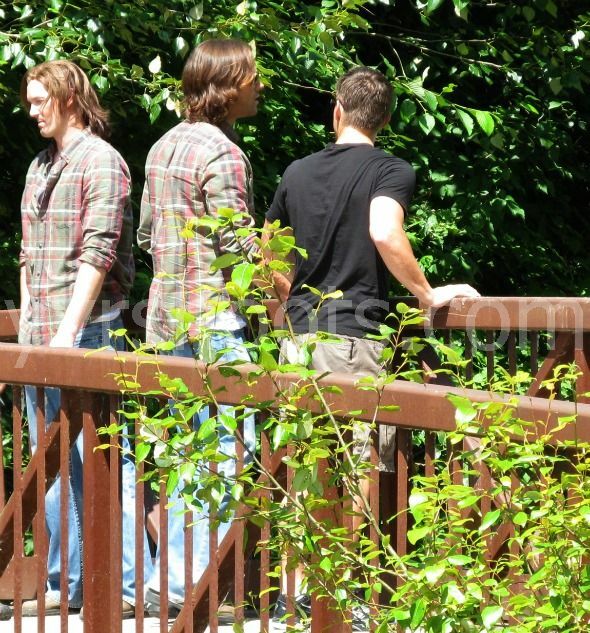 And here’s Jared Padalecki and his director Jensen Ackles arriving on set to discuss the scene. After a couple of rehearsals, Supernatural closed the bridge to foot traffic and pushed spectators back. I stuck around longer than intended hoping to catch a glimpse of Liane Balaban as Amelia, who’s said to be a doctor with a damaged soul. This was the best I could do from the sidewalk in front of Nokia. these are just awesome! Thanks for sharing!! FanLiane – That IS NOT Liane’s official twitter account. Her real twitter acct is simply @LianeBalaban NO UNDERSCORE AT THE END. Susan – We had a good laugh at bugging Justin because he called his shots “first shots” but you clearly had yours out before his. We told him he was going to have to revise his tweets to read “second shots”. Good job…. didnt realize you got pics of them on the bridge. Thanks John. Don’t usually say First Shots but after Justin’s tweet I couldn’t resist. He did get the First Shots and good ones too but yours were the best. Thank you so MUCH! Love Jensen and Jared, love the brothers, and it’s refreshing to see them again, missed them. Thanks, man they are looking good. Thanks so much for sharing the pictures! I was hoping to get a glimpse of them in Langley over the next couple of days but understand that is a very closed set. Thank you so much for the updates and pics. Some one is a UK fan! GO BIG BLUE!!!! 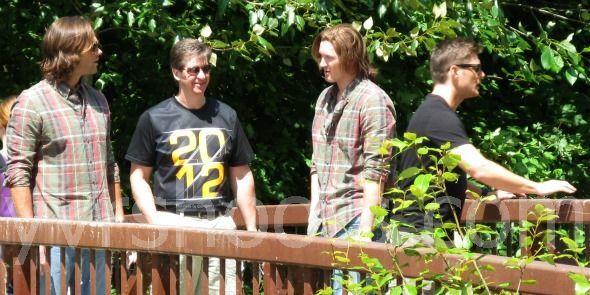 JULY 12th, 2012 ~ We Want Supernatural On Ellen Day! Great pics! Keep em coming! Thank you for the pictures and great article as always. I wondered if you heard the scene when they shot it, and if you knew whose birthday was it? I mean, I wondered if the “Happy Birthday” was in the scene (since I heard them say it twice) or it was just Jared telling someone on set? I didn’t hear Jared say Happy Birthday in the scene on the bridge. 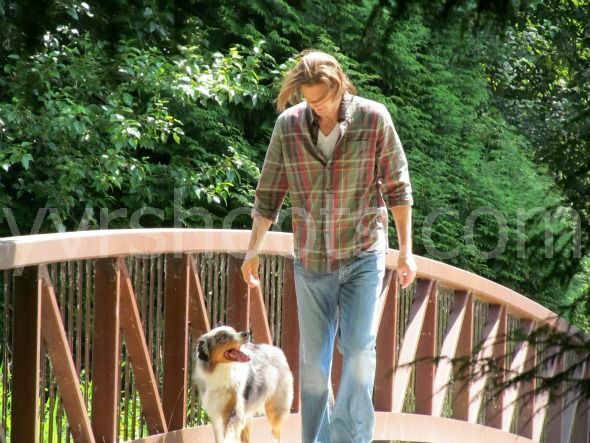 He called out “Amelia”….”This isn’t funny”….then “Ryan” (which might be the name of the dog which runs off towards where they filmed the scene with Liane Balaban as Amelia). Jared might have said Happy Birthday in a scene with Amelia before she dropped to the ground?? I didn’t hear any of their dialogue. LOL this scene sounds like the end scene from, “You got Mail” hahaha, I think I might love it! Who is Jared and who the standin? Love it, this will help the hiatus go by so much faster. Thank you for these photos they are gorgeous. But Ruby was never Sam’s girl friend or a love interest. Ruby was the grief, loneliness,desperation and physical need found in Sam but never did love enter the picture. Such gorgeous photos! 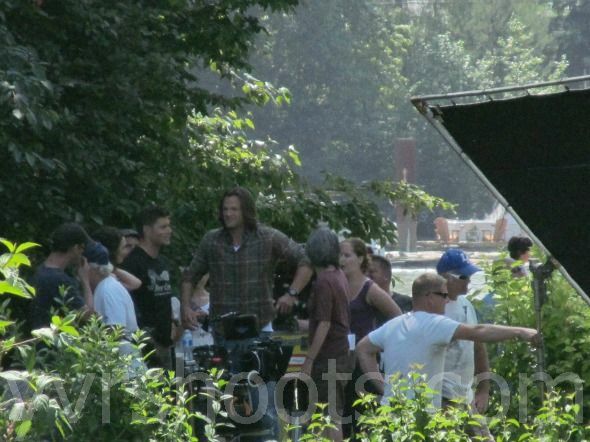 I’m so glad it was sunny for this scene, and I can’t wait to see what Jensen did with it on screen. Thanks for sharing with us! Adorei as fotos pois estou na expectativa de logo poder assistir a 8°temporada eles são realmentes lindos!!!!!! e talentosos!!!!!!! 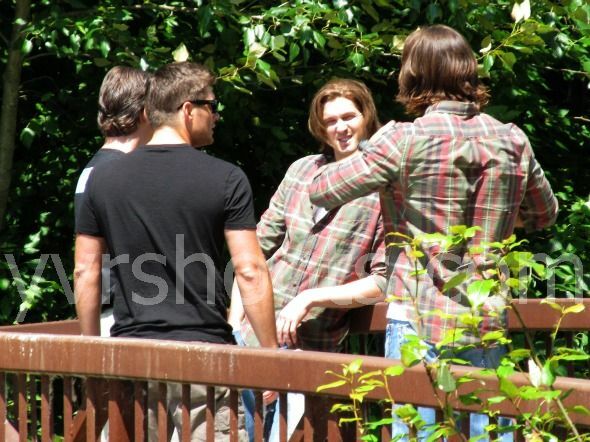 These are the best pics of Jensen & Jared ..looking always their best as ever..the weather is so great in Vancouver at this time of the year…Jared’s hair is so gorgeous and shining in the beautiful sunshine..My God these boys are getting more sexier and hotter than ever as they grow older…and there are two Jareds ( stunt)..that’s funny..!I like the pics of Jensen and Jared on the bridge ..Jensen directing his buddy Jared .. how sweet.. Can’t wait to see this episode with Amelia…Sam’s new love interest!! how exciting..it’s about time Sam got a girlfriend at last!!.. but will she last ??!! hey susan.. thanks for sharing the pics.. how was it to watch them together.. am sure jensen had great fun in directing jared..!! i am just in awe and in love of their bromance.